The league was turned upside down more than once over the season. The consensus league favorite Miami ended up on the bottom of the league when the regular season ended. But it was the Redhawks who pulled the series upset at first place Saint Cloud State moving on to shutting out North Dakota in the first round of the Frozen Faceoff. It wasn’t until Denver and the championship game that Miami’s run ended in a 4-3 loss. And it wasn’t just Miami making turn arounds. 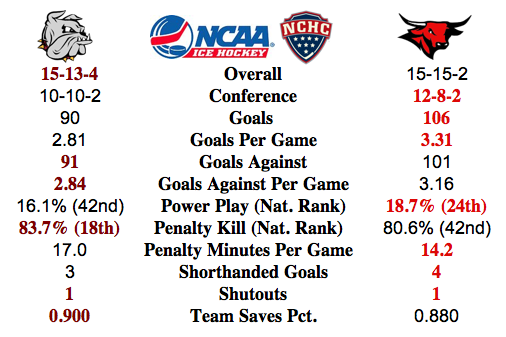 Denver was not pegged to be sixth in the league standings, but that did not stop them from grabbing the NCHC auto-bid. The auto-bid was the only way the Pioneers were to get into the NCAA Tournament. Speaking of the NCAA Tourney, the NCHC ended up with three teams. Not necessarily surprising looking at the teams in the league. But the way things shook out, especially the poor non-conference records by many of the league teams, it is still surprising that three make it. But the result is North Dakota is seeded #13 and Denver #15 in the 16 team field. For that matter, Saint Cloud is #9. Successful? Yes, for the number of teams in the tourney, but the “super conference” theory proof looks more towards many teams beating each other up for a regular season. The NCAA tourney seedings is evidence of that. In short, the league survived the absence of two of the three near-by schools, Saint Cloud State and Minnesota Duluth, while putting on a good show and getting pretty good attendance. The Target Center still has room to improve as a hockey venue, but much was learned over the weekend and changes are already in the works for next year. The Saturday of the NCHC Championship is finally here and if you asked fans six months ago what teams will be playing in Minneapolis for Championship game you may have gotten a bunch of people who said Miami and Denver. If you asked those same people three weeks ago you probably wouldn't anybody have anybody suggesting such a match up. Denver advanced despite not playing their best game yesterday. They were able to bounce back from some miscues and get a late third period goal from Ty Loney to beat the Broncos 4-3 to advance to the Championship. The shots were on the low side with the advantage going to the Broncos 27 to 23. The biggest surprise to me was the fact only three penalties were called the whole game, two on the Pioneers and one against the Broncos. Miami continues to wear the glass skates as they are trying play their way into the NCAA tournament. The Redhawks were able to quiet the crowd that consisted mostly of fans of the North Dakota men's hockey team. They were able to do just that with an impressive 3-0 win. North Dakota slightly out shoot the Redhawks 32 to 28, but the Redhawks did great job controlling the tempo when it mattered. The Redhawks advance to the Championship as North Dakota will play the Broncos in the third place game. My guess the third place game will be the final game played by North Dakota this season. There no longer is such a thing a good attendance and college hockey playoffs. It didn't matter which conference game I watched since this past Thursday when the playoffs started attendance is poor. My opinion for this is the distance between the Universities and the locations as the cause. There appears to be less fans of college hockey in general and more fans of their one team only. Living in Minnesota I always hear how great the Minnesota fans (and Gopher fans) are of hockey, how many Gopher fans will be at the Xcel today for the Bi6 Ten Championship game? My guess is you won't see many. The six conferences will mean more automatic bids so if you want to get into the NCAAs you better be in the top 10 of the pairwise while the conference playoffs are happening or you should win your tournament. Ohio State and Miami are both playing great hockey right now in the State of Hockey. Without a win in the third place game to North Dakota season is done and even with a win it looks like to me there season is over. They need all of the favorites and high ranked pairwise teams to win so they don't get bumped. Has anyone heard the body clock and different routine as the excuse for the loss by North Dakota? It must have been uttered yesterday. Miami versus Denver: Denver managed to find a win despite some poor play to advance. I like their defense and of course Sam Brittain, I think the Pioneers have the advantage in this match up. Both teams are playing for another game after this one so it should be a good one. Miami probably has the scoring advantage right now, but will they be able to bounce back if they fall behind? My gut says Denver wins and plays in the NCAAs, maybe even playing the Gophers next week. Western Michigan versus North Dakota: I don't like third place games, maybe the only thing worse is deciding hockey games with a shoot out like in the Olympics. Will the Broncos take this last game of the season seriously as they have nothing more to play for this year? We know North Dakota will be trying to win. I like North Dakota more but wouldn't be too surprised to see a tie. No as I say that North Dakota would probably pull the goalie in overtime since a tie won't help them for the NCAAs. For this I will go with a North Dakota win.